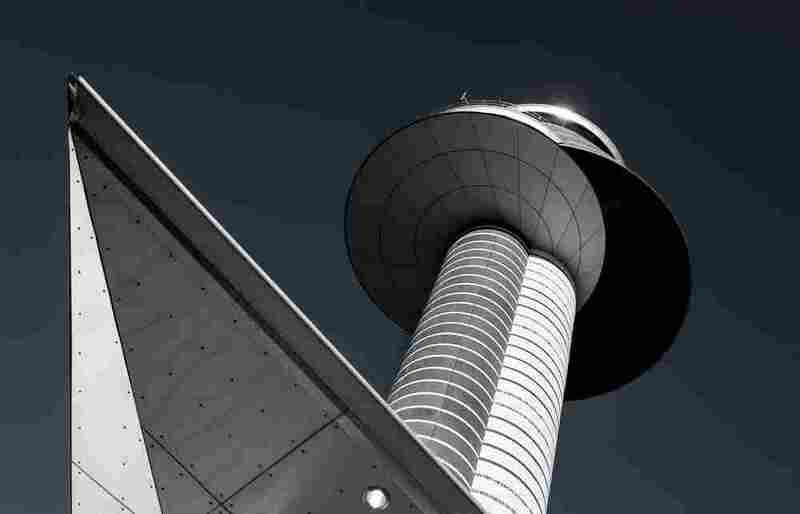 Prepare For Takeoff: Smithsonian Celebrates The Art Of The Airport Tower Photographer Carolyn Russo says these beacons of the landscape serve as "cultural greeters." 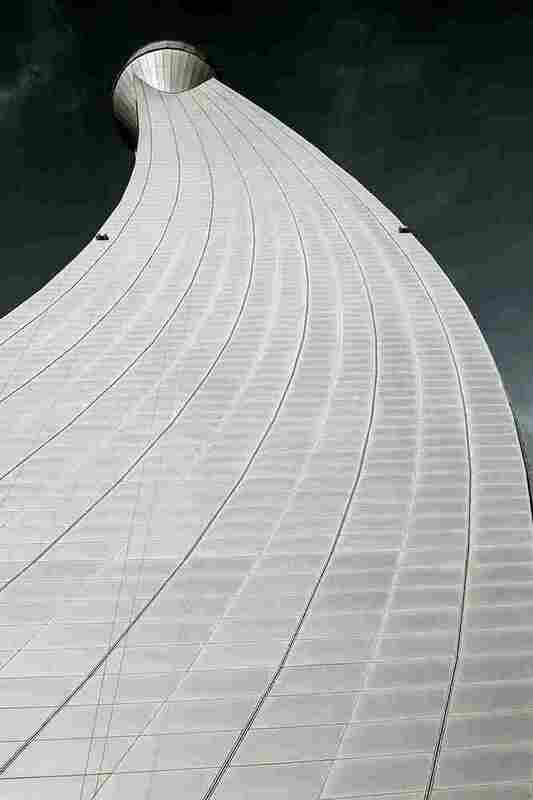 Her dramatic photographs are on display at the Air and Space museum in Washington, D.C. The two control cabs at the Stockholm Arlanda Airport symbolize two ravens from Nordic mythology that were tasked with watching over the earth. Just in time for the holiday travel season, the Smithsonian's National Air and Space Museum has an exhibit about one aspect of flying that most of us ignore: airport control towers. Those beacons of the landscape — where landings and takeoffs are orchestrated — are now the stars of some dramatic photographs. The tower at the Abu Dhabi International Airport was built in just 629 days. It was completed in 2011. On their way into or out of the skies, pilots are guided by the calm voices of air traffic controllers coming in over the radio. Inside the tower, controllers are the 24/7 traffic cops of the sky and ground. As you're in the air watching a movie or trying to sleep, men and women are hard at work in their towers. They mostly go unnoticed — but not by photographer Carolyn Russo. On flights, Russo sometimes gets into conversations about what she does. 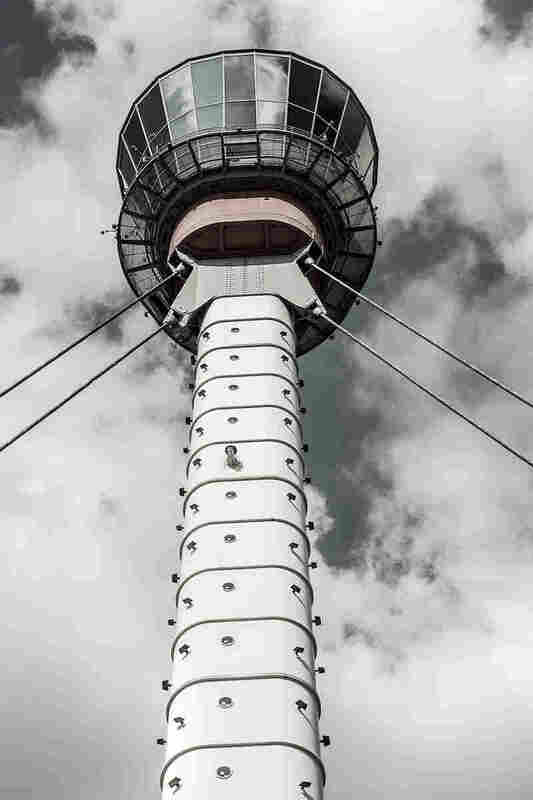 "I'm here to photograph the tower," she'll tell curious passengers. "And they would just look at me like I was nuts — like, why would you want to do that?" she says. Russo's dramatic black and white photographs turn the towers into abstractions. They "become art," she says. To her, they are "symbolic objects of beauty." Russo thinks London's Heathrow observation deck looks like a gentleman's top hat. "The smooth, creamy concrete vanilla color and the texture and the dark black circles — to me it looked like Swiss cheese," Russo says. 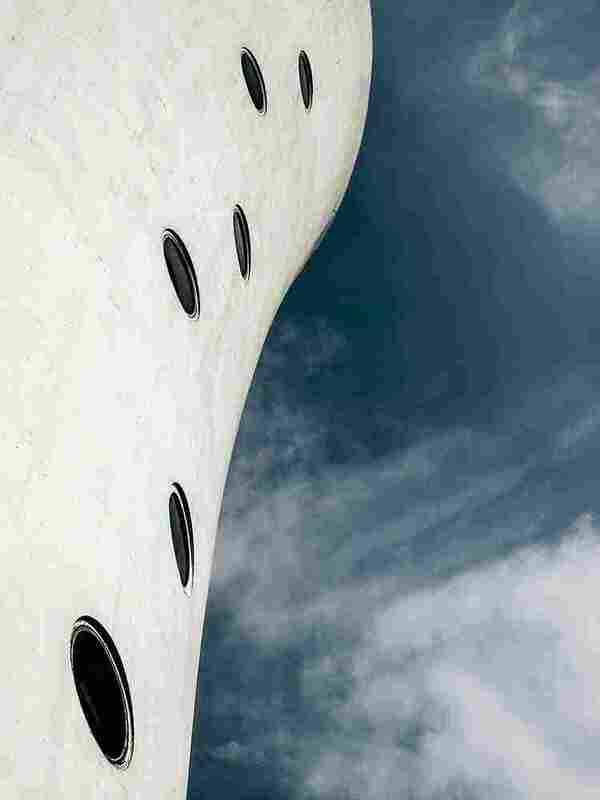 Then there's the sleek, crescent-shaped tower at Abu Dhabi International Airport in the United Arab Emirates. Russo says it looks "like the flowing robe of the traditional dress. For me it's like a man with his robe gliding across the desert," she says. London's Heathrow observation deck looks like a gentleman's top hat. Paris' Orly tower reminds her of a badminton birdie. New York's JFK reminds her of a swan. As a Smithsonian photographer and curator, Russo wanted to share what she saw through her camera lens. She wanted "a way to capture these gigantic structures and bring them back into the museum," she says. Despite what many passengers might think, the air traffic control towers govern only the beginning and the end of the trip. "Most of the route you're under the watch of en route controllers who are not in the towers," explains Bob van der Linden, the Air and Space Museum's curator of air transportation. "They're in dark buildings watching monitors." When the tower at LaGuardia's Art Deco Marine Air Terminal was originally designed in the 1960s The New York Times described it as "a design for a giant ice cream cone." In the early days of flight, there weren't any towers. There weren't very many planes, so men on the ground waved them in, with flags or lights. Only a small fraction of the population flew. "It was for the wealthy and businessmen and that was about it," van der Linden says. That changed with airline deregulation in 1978. More people could afford to fly, and so they did. With more passengers in the air, traffic cops in towers were needed to help fly them safely. Nowadays, the traffic is fierce. "At any moment around the clock, there are 600,000 people in the air," van der Linden says. That's roughly the population of Washington, D.C., — where you can see the exhibition "Art of the Airport Tower" at the Air and Space Museum through November 2016.